There's being a tourist and then there's reflection travel. I love to go to all the places that people recommend on well known travel sites I frequent like Travel Noire and Matador but then I like to go somewhere to reflect. At least one day on one of my worldwide adventures, I love to go somewhere off the beaten path. I know it can't be completely off the beaten path if I'm there, but I do like to explore a place that is not atypical of an American tourist. In South Africa, that is the townships. The townships in the very early staged of apartheid South Africa were places where Black South African men lived when they were migrated to work in the mines or other industrialized work. As apartheid grew and became the law of the land, Black, Colorued, and Indian South Africans were forcibly removed from their homes and forced to live in segregated townships. 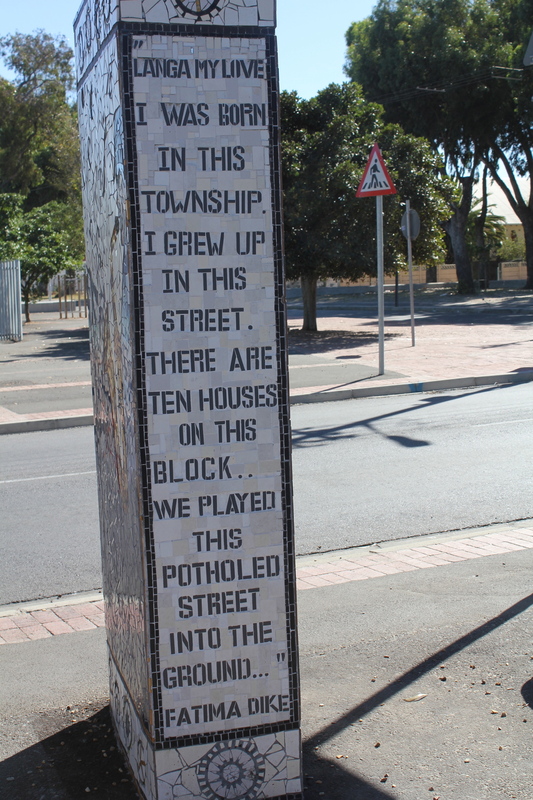 Since apartheid and the transition to democracy, townships have become places where some of the poorest black South Africans live while other working and middle class black South Africans continue to call home. While I don't encourage you to go to Langa and pass out shoes (because they have on shoes) and gawk at some of the makeshift houses, I encourage you to visit as part of your exploration of a country that has a luxury economy. It is important to see all aspects of peoples' lives. 1.) The people. You can tell an amazing country by how genuine, welcoming to strangers, and honest it's citizens are. From the moment we rolled in Langa township on a Saturday afternoon, the people were waving, talking, and giving us great ideas. We made our way to Langa in a taxi van that was extraordinarily cheap and is traditionally reserved for locals on their way to work. The purpose for my journey to Langa was to see a stepping show by low-income students who belonged to a charity called Happy Feet. The students were so happy to enjoy an audience of eager supporters. As we ventured by foot through the various sections of Langa, we were met by school girls and toddlers looking to play with us at every turn. I strongly recommend working with Happy Feet to book a tour. 2.) The History. South Africa in general is an incredible place for avid fans of world history. Langa township is a great place to see small remnants of apartheid-era grief and post apartheid pride. The houses are brightly colored on many tree lined streets with amazing street artwork that is a visual reminder of how much the residents of Langa love to live here. Though the township was a forceable residence for many, it has become a place of choice for those who seek affordable accommodations and cultural similarities with their ethic groups. The township consists mostly of varying types of housing including public, privately built middle class homes, and make shift homes. The businesses serve the community which include barber shops, beauty salons, cell phones stores, fruit stands, restaurants, and political offices. The buildings display a wide variety of conscious graffiti and paintings to martyrs of the movement, singers, and rising political stars. The township, like any place in the world that was meant to close of people in poverty from the rest of society, has an entirely different history and culture worthy of seeing. It's a great place to get lost in for an day. I strongly recommend going o a walking tour and speaking to friendly locals as much as possible in an effort to take in some oral history and local legends. 3.) The Street Scene. There's no other way to put it. If you are looking for authenticity, if you are looking for a place that lacks the hustle and bustle of European tourists, then Langa is a place worthy of your time. Langa's street scene is impeccably satisfying. On any corner you will find people gathered around an old stereo listening to pop music or traditional Xhosa drums, and dancing. Right there. On a Saturday afternoon. You will be constantly engulfed in the smell of barbecue. You will see a goat or stray dog pass you by. You will see women running for taxi buses and old men sitting in folding chairs drinking out of slenderized Coca Cola bottles. You can sit in Langa and people watch forever. And it will make you happy.